Ute Safe offers a standard range of aluminium tool boxes to provide a fast response to your storage needs. The Ute Safe standard range of aluminium tool boxes have evolved from some of our most popular custom built box designs. These ute storage solutions are also available with shelves and supports that can be added to suit your requirements. Our standard range of aluminium tool boxes can be viewed in our product gallery along with information on the dimensions and a description of possible box uses. 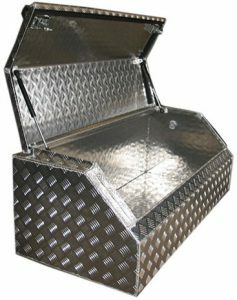 The standard range of aluminium tool boxes is available for purchase online via The Toolbox Company. Our boxes are built using high quality 2.5mm 5052 aluminium tread plate, which ensures that they are long lasting. They are fully T.I.G welded and backed by a Ute Safe warranty. From the design, to the manufacture, to the sales, and the delivery process, we aim to provide the best possible services and products to our customers.